Bout of Books starts on Monday, January 2nd and goes through Sunday, Janury 8th. 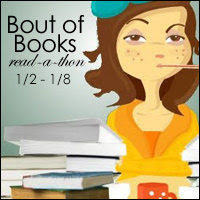 My goal for the Bout of Books 18 TBR pile is to read 250 pages per day, which amounts to 1,750 pages for the whole week. This is a hard one to predict my books this far in advance with me still in vacation reading mode, so this TBR may change, but this is what I am hoping to read. This is a total of 1,758 pages! I'm glad you're joining in the fun! I hope you're able to meet your goals! Good luck!